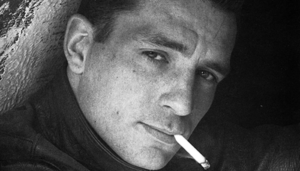 If Jack Kerouac wasn’t the one who invented “hip,” if the Beats’ claim to be the authors of “cool” is false, who were the first real hipsters? Start with the beginning, “the generation of 1914,” men and women born between 1880 and 1900. No generation had ever grown up in a situation anything close to what this group experienced and despite their colossal failures, they invented the modern world. Their story resonates today. It seems familiar because it is. The difference between them and us is they were first, the first moderns, the first of a new type of human. The birth was difficult and the story doesn’t end well but in so many ways, they made us and hopefully we can learn from their triumphs and their despair. Up to that point, it had always referred to the difference between fathers and sons or to people born at approximately the same time. Starting around 1900, “generation” signified comrades in age and experience. More exactly, it referred to the gulf separating youth from the older generation. Vladimir Mayakowski c. 1912, the year he and three other leading Russian poets wrote a manifesto entitled, A Slap in the Face of Public Taste (1912) in which they discarded all classics and accepted writers of the period. The whole concept of youth changed. Industrialization created a new kind of career, salaried white-collar office, and civil service personnel. Big business recruited masses of this new employee with the required university degrees. Students now went from secondary school to university and the period of youth grew longer. Early forms of mass media spread the imagery and the message of the young to the young. The term “youth” now signified a distinct special interest group. 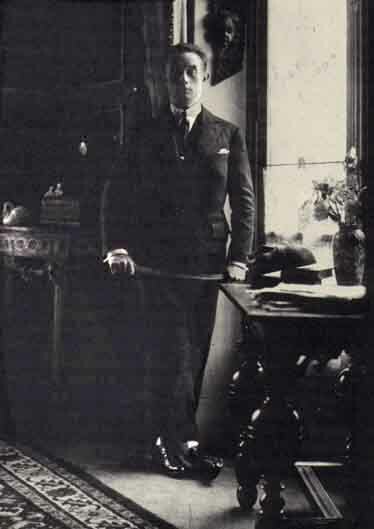 Henry de Montherlant c. 1912. That year, he was expelled from his Catholic academy for a homosexual affair with a classmate. That was before 1914. The first years of the 20th century had been an era of optimism, progress, and prosperity. Visual artists disrupted form and created a new aesthetic that reinvented cities, fashion, and products. Emerging technologies and scientific developments changed attitudes and lifestyles. But World War I disrupted everything. What was supposed to be “The war to end all wars” turned out to be an epic blunder promulgated by incompetent old men for the sake of finance and profit. It provoked a generational revolt. In Europe, every young man served and for the first time class distinctions faded. They were all one in the trenches and new philosophies born of war and PTSD, unknown at that time, became foundations for the radical politics that emerged after the peace. The revolutionary mentality confined to the Avante-Garde in the early years of the century spread throughout the mass of troops on both sides. Ernest Toller I was a German, Lonon, 1934. 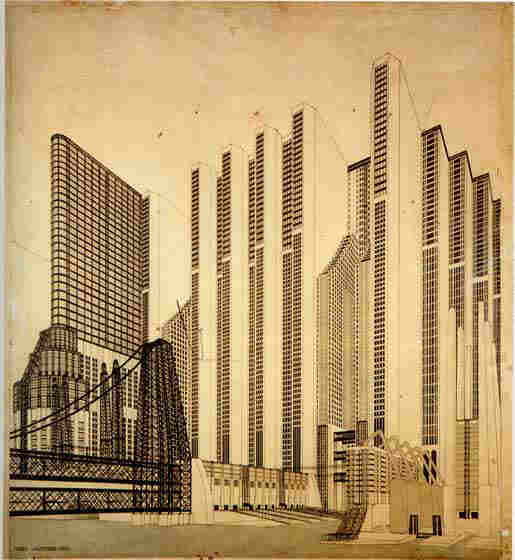 Mario Chiattone – Construction for a modern Metropolis 1914. Pierre Drieu la Rochelle, La Comerdie de Charleroi, 1934. 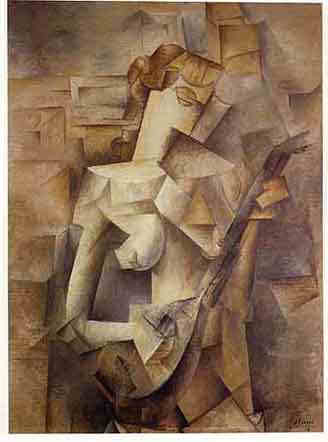 Pablo Picasso, Girl with a Mandolin 1910. Richard Aldington, Life for Life’s Sake, 1941 pp 203-204 (cited in Wohl, The Generation of 1914, pp. 290-292). 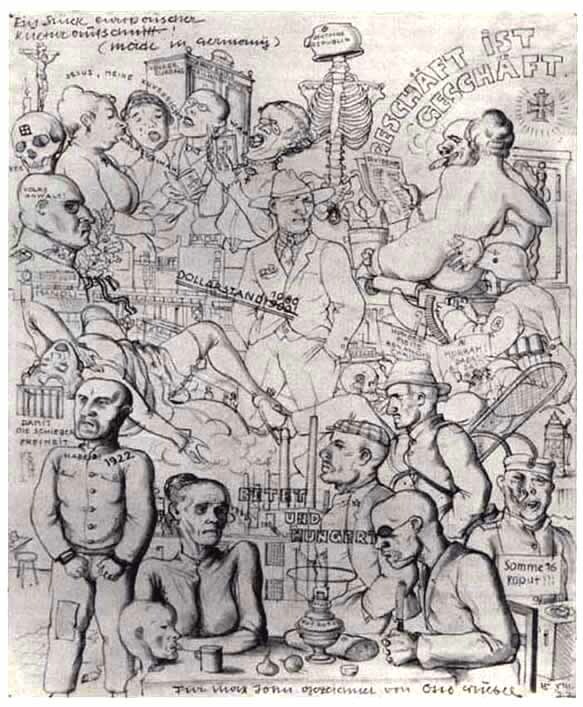 Ein Stuck Europaischer Kulturaufschnitt (A Slice of European Cultural Ham) Made in Germany; Otto Griebel, pencil on paper 1922. It was clear. Youth were the victims of warmongering old men. Youth took comfort in their belief that the war had been a cleansing of the old, a necessary preparation for the birth of the new. Older veterans returned to their jobs and families but millions of young men had only ideologies of the Front which they brought back to a society in the midst of technological transformation. Young women who had entered the workforce like never before during the war felt trapped in low paying jobs and political powerlessness. They were subject to the same disillusionment affecting young men. 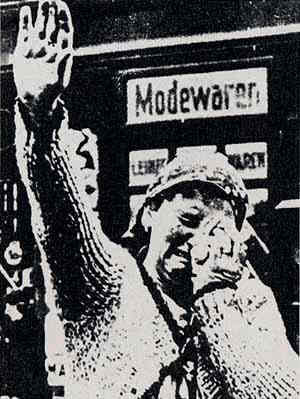 Between 1917 and 1920 a revolutionary wave broke over every European country. Armies grew restive and mutinied, urban populations staged riots and insurrections over rising prices, unions swelled in membership and workers began to challenge factory owners. The Dawes Act infused massive American funds, pacified Europe and brought Germany back from the brink of total collapse. Socialism failed in Western Europe and Russian Communism was turning toward the totalitarian system the West had feared. In the West, “money and the mob” took over. 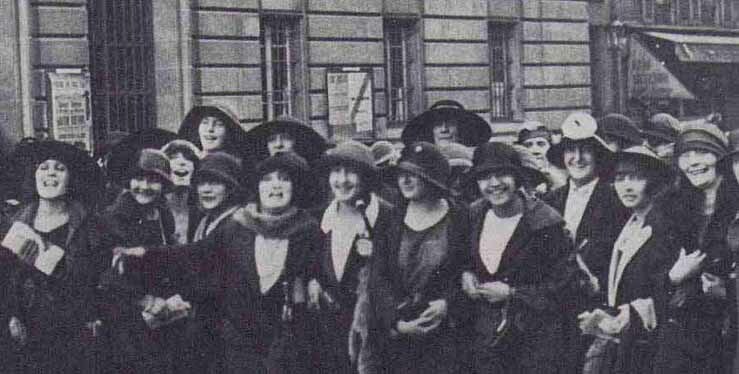 As the twenties began to roar, radical political movements went underground and simmered. The scramble for wealth was all that mattered. To drown their disillusionment, young people turned to physical experience and enjoyment and gave up on making changes they’d committed themselves to not so long ago. The urge to travel was universal for those who had the means. The “new woman,” high strung, too slender, athletic, having discarded her corset for designs of Coco Chanel was constantly on the move. Influencers, now media celebrities, were always in motion; on horseback, dancing, driving open-topped and anticipating jet-set society. 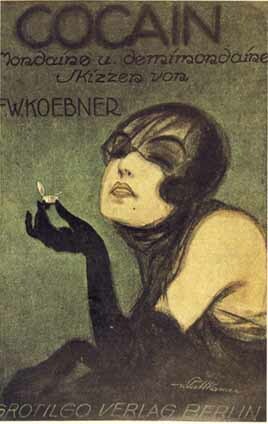 Con Brio; Ferdinand Preiss. Cold painted bronze and tinted ivory on banded marble and onyx base c. 1925. 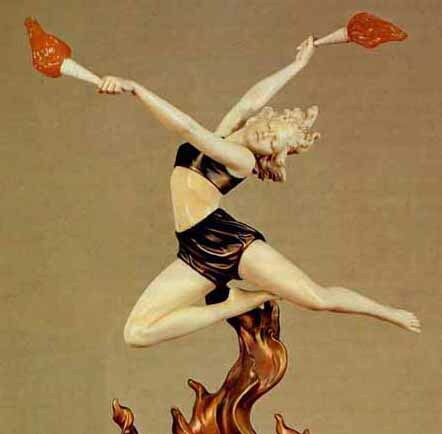 In 2007, this 15″ sculpture was sold for nearly $50,000. Three decades before Jack Kerouac wrote the first draft of On the Road, the generation of 1914 captured imagery of the open road as freedom. 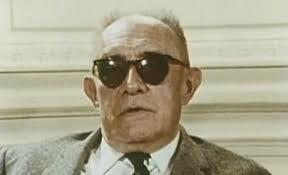 The writer who best expressed the restlessness of the era was Frédéric-Louis Sauser. 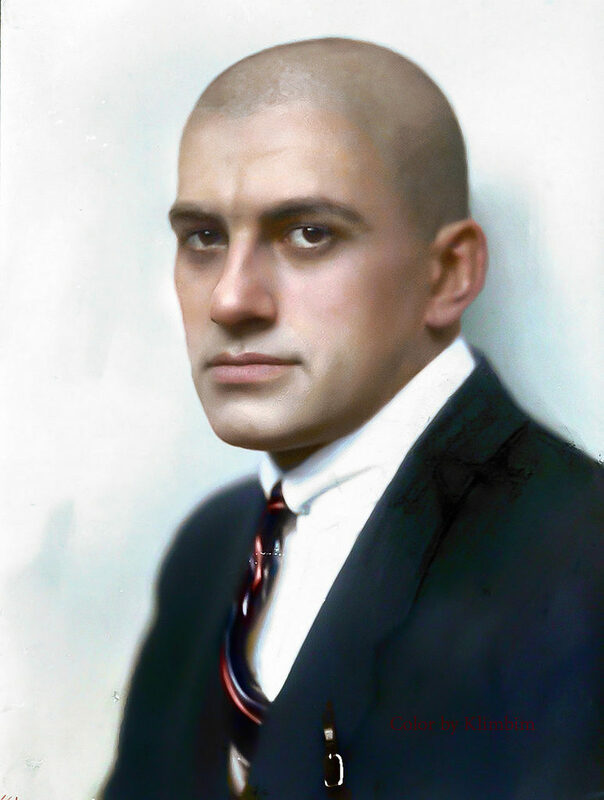 He became famous as Blaise Cendrars and invented modern storytelling. Cendrars wrote action as it had never been written before. Real life was “crime, theft, jealousy, hunger, lies, screwing, stupidity, volcanic eruptions, earthquakes, heaps of corpses.” Action alone liberated. 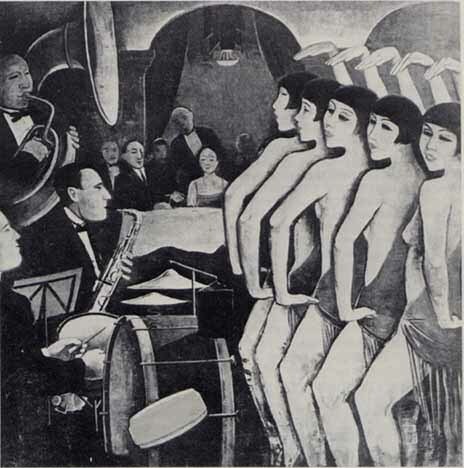 The soundtrack for the new narrative of action was American Jazz emanating from the Harlem Renaissance and it became the rage in Europe just as it was in the United States. People came to Paris from everywhere; exiled Russian princesses selling off their jewels, aging American women seeking to rekindle flames of their youth in the arms of dark gigolos. Socialites frequented “Black balls” and danced the Black Bottom. Mass media emerged in the 1920s. Suddenly, everyone owned a radio and jazz was the universal language. 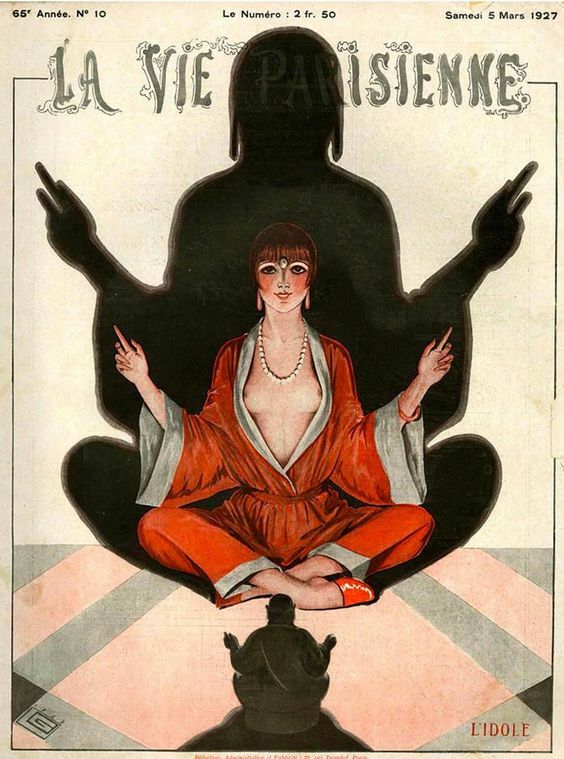 This was the moment of the “Cabaret,” a meme that actually existed, especially in Berlin and Paris, living proof the generation of 1914 invented the modern way of partying. 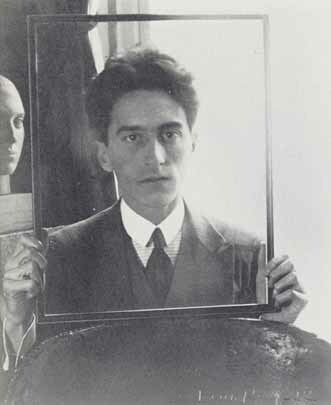 The Baouf-sur-le toit was a hot Parisian club named after one of Jean Cocteau’s latest movies. 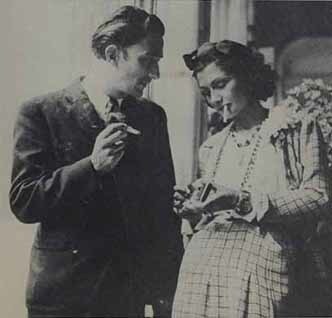 It was a small club in the rue Boissy d’Anglas and the most beautiful women in Paris could be seen there accompanied by men in fine tuxedos drinking and dancing next to someone like Picasso in a sweater or Coco Chanel sporting the asymmetric look with only one eyebrow. 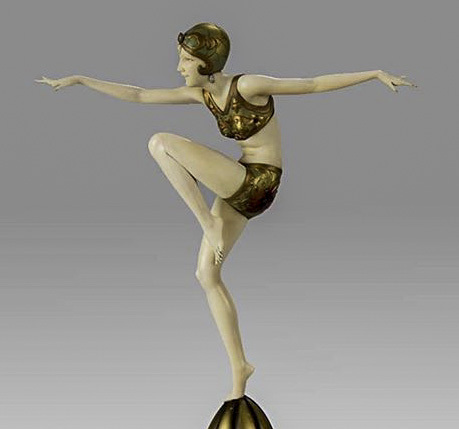 Celebrities like the ballerina, Caryathis, often led the dance from a small stage elevated above the crowd like what “go-go girls” would do much later in the twentieth century. Cigarette smoke filled the room, liquor flowed freely, cocaine was available. 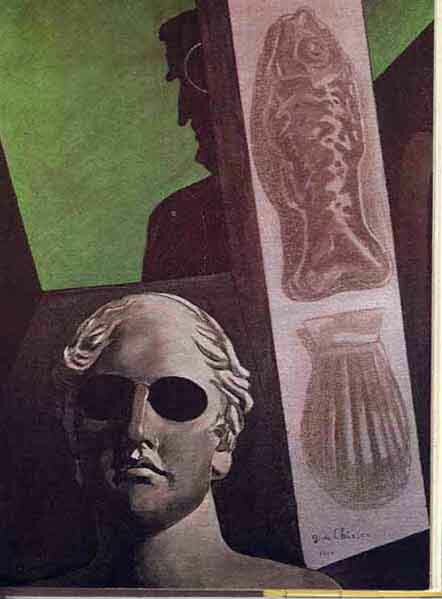 Revolutionary Dadaist paintings, now objects of decoration, hung on the walls to add an atmosphere of rebellion and excitement. Americans had first seen the new European art in New York, at the Armory Show in 1913. Paintings by Picasso, Braque, Matisse, Kandinski, and many others helped stimulate the building boom of Art Deco skyscrapers that made Manhattan the iconic urban skyline. Though Paris and Berlin were still the centers of culture, New York was the city of dreams for European Influencers. Along with American funds, American culture was injected into Europe after the war. But many of the intellectual elite were skeptical, even hostile. Transformation to the American method of business was called “rationalization.” It was soulless and American culture was crass. They feared capitalism and the masses, “money and the mob,” would snuff out “spirit,” the distinctive European heritage and set of values which had evolved over centuries. This proud legacy was easily distorted into what became the basis of Fascism. When the American stock market crashed in 1929 and the Great Depression hit Europe in 1930, social experimentation ceased. Radical movements resurfaced and gained power. In the beginning, no one could foresee what Fascism would become. Concepts of “left” and “right” as we know them were not yet clearly defined. Fascism arose as a spiritual rebirth and a political revival promising the creation of a new man; a middle-class alternative to both the rising tide of Communism and the crass capitalism of the Americans. “Youth” became a tool of propaganda. 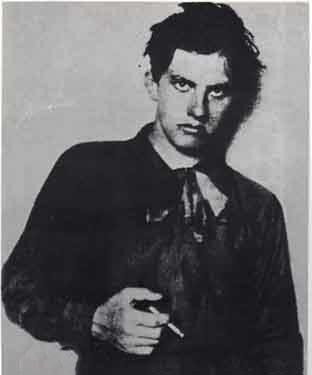 Partisans of the Bolshevik revolution, of Mussolini’s Fascism, and eventually of Hitler’s Nazis used the idea of youth and generational solidarity to attract and control their followers. Ideals of democracy had become associated with pointless war, gross exploitation of workers and the stifling mediocrity of a middle class manipulated by big money. The rhetoric of radical right and left was often indistinguishable and they shared a common belief in secret underlying connections between the two factions, a belief that made it possible for many to pass from one side to the other in their search for solutions to the personal and collective crises of the period. Had any group been dealt a worse hand than the generation of 1914? Have youthful aspirations of so many ever been so thoroughly crushed yet, has any generation ever accomplished so much despite such complete misfortune? It’s hard to agree with that statement. True, they didn’t leave us heavy tombs or treatises of philosophical principles like earlier European thinkers. But who cares about Nietzche anymore? What does he have to say to us today and who would listen? He was a brilliant madman who died in an asylum. What about Hegel, or Descartes, or even Marx? The generation of 1914 left much more than an “imprint on the language, and literature of the 1920s.” They changed the art of storytelling for all media and that influence reaches us every day. They set examples for living in a fully industrialized modern society which are still relevant. They conceived designs for the cities we inhabit today. It’s been said we live in a “Postmodern” world but looking at what the generation of 1914 left behind, it’s clear that most of us could feel at home in their world. The differences between then and now are more minor than they are daunting while the similarities are truly surprising. Not much has changed there. In fact, that psychological fragility could be getting worse in our own time due to the “overwhelming speed of change in a world overtaken by the” third phase of the industrial revolution. It comes via non-stop connectivity and social media. It’s an inescapable fact of life in our age, whether called modern or postmodern, and humans haven’t learned how to fully adapt. We are still a living experiment. Henry de Montherlant, 1971. He became one of the best-known writers in French. His anti-feminist tetralogy Les Jeunes Filles (The Young Girls) (1936–1939) sold millions of copies. In 1972, in failing health, he committed suicide. 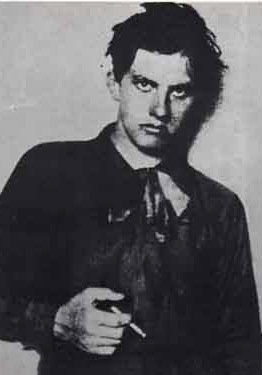 Mayakovsky in 1927. He became the most famous Russian literary intellectual of his time. 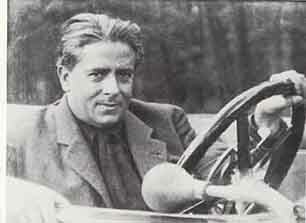 By the late 1920s, the Soviets no longer needed rebellious Influencers and revoked his passport. 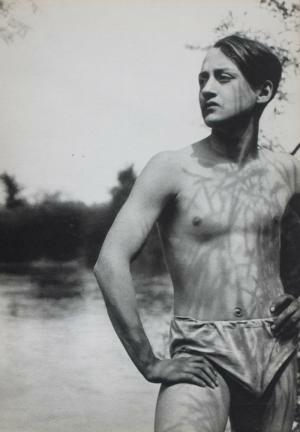 After a series of failed romances, Maiakowski committed suicide in 1930 at the age of 37. It seems obvious their interest in these movements grew out of their own fears and their fears for the rest of society. But Professor Wohl could be right. Perhaps the generation of 1914 suffered from mass narcissism and was totally unconcerned with the plight of working people. Somehow, I doubt it. Perhaps they were so removed from the reality of those working classes they were unaware of the suffering. If that is true, it feels eerily similar to the situation in the USA today. The Presidential election of 2016 demonstrated that all too clearly. After the war, the generation of 1914 lost faith in Democracy and followed leaders into what was believed to be new and better forms of government. Professor Wohl rightly criticizes them for that but on second thought, they weren’t the first. Writing at the end of the ancient Athenian renaissance, both Plato and Aristotle concluded that democracy always degenerates into an oligarchy. Humans have still not solved that problem. 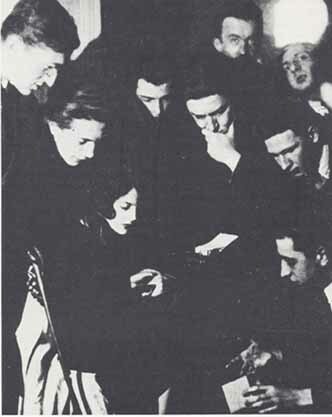 A group of Surrealists surrounds Simone Breton who operates the newest tech, a typewriter. They believed it would change language through “automatic writing,” writing that comes directly from the subconscious. 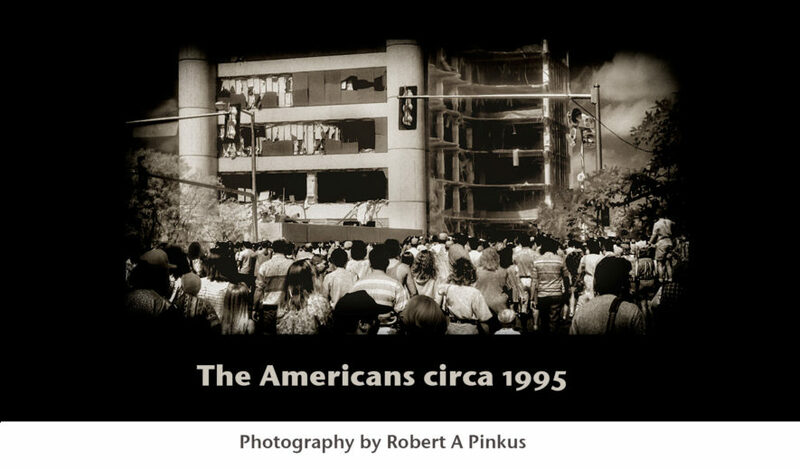 As a group, they were never able to free themselves from their war experience, a pervasive shared belief that they were living through an apocalypse out of whose smoke and flames would be born a new world in which the wrongs could be set right finally and for eternity. They never gained the insight that living society is a process of continuous rather than intermittent, revolutionary change and that even in times when a revolution is inevitable, change itself is not dependent upon a complete repudiation of the past. 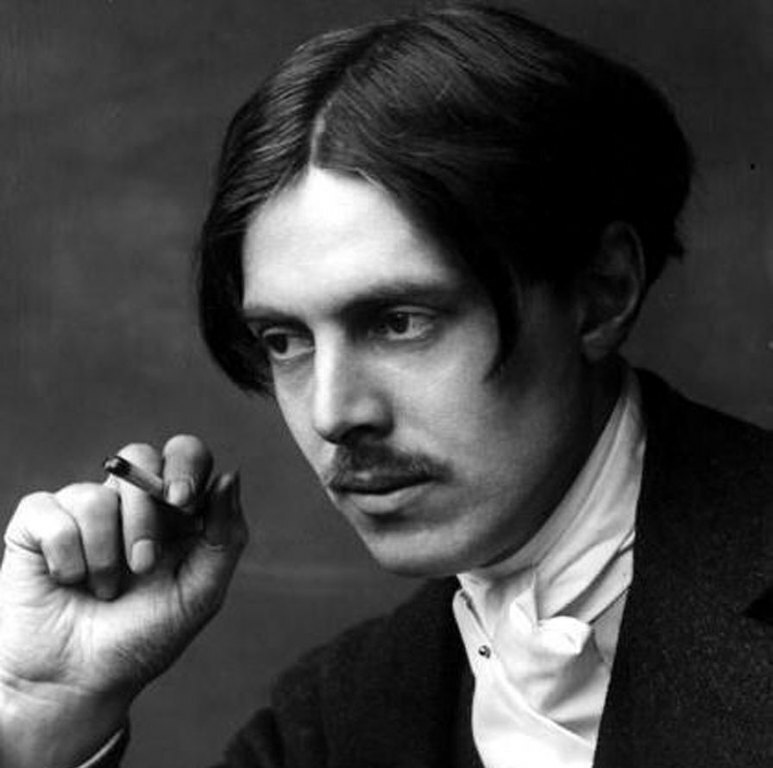 Wyndham Lewis c. 1910. 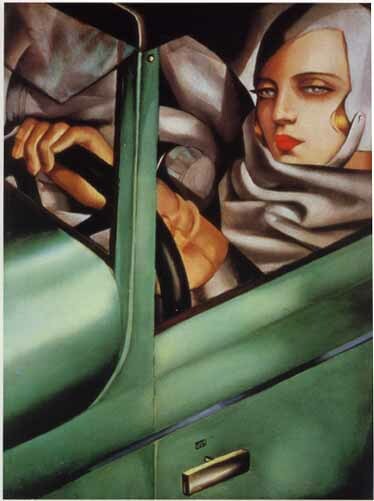 Lewis created the short-lived British art movement, Vorticism, which borrowed from Picasso’s Cubism and Italian Futurism. Futurism supplied the method and style for Fascist ideology. 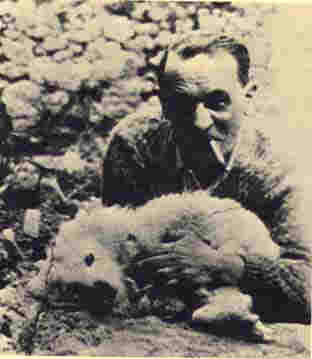 Mussolini learned his rhetoric from Futurism’s founder, Tomasso Marinetti, whose technique of in-your-face promotion became a model for modern advertising.